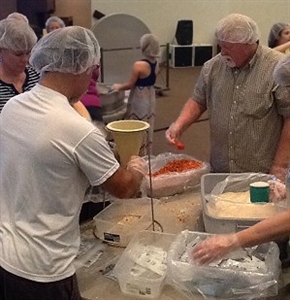 Way back in June 2013, it seemed like a major stretch for Florida Conference churches to commit to packaging one million Stop Hunger Now meals over a year’s time. 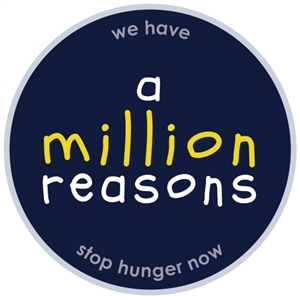 To get a head start and kick off the “A Million Reasons” campaign, Annual Conference attendees packaged more than 100,000 meals at their meeting. Eight months later, the conference proved that “A Million Reasons” is just the beginning in the churches’ effort to fight hunger. Churches that packaged meals the weekend of Feb. 22 blew past the goal. (Click here to watch video of a church packaging that weekend.) Those churches that will package in the months leading up to the AC 2014 meeting will show that the conference can exceed goals and expectations because “we are connected to one another,” observed Rev. Pam Carter, who issued the challenge to the conference. “I am so thankful for and proud of the Florida Conference churches. More than 50 United Methodist congregations across Florida have packaged 1,067,284 meals to date. They will be distributed around the world in the fight against hunger, according to Stop Hunger Now, a 15-year-old non-profit organization whose mission is to end world hunger. Denomination-wide, United Methodist churches have packaged 29.6 million meals through 2013 (since the program’s inception), more than 22 percent of all Stop Hunger Now meals. “My hope in issuing the ‘A Million Reasons’ challenge was to open a door to a way churches can experience how easy it is to be missional, how effective and how do-able it is to have a huge impact on people’s lives,” Carter said. “I know every pair of hands that packaged meals has experienced this as a blessing to them and to other people. No matter how small the church, this is a mission initiative that the congregations can do more than once. For a list of churches that have participated (through Jan. 31) and other “A Million Reasons” campaign information, click here or go to www.amillionreasonsumc.com. To learn more about Stop Hunger Now’s meal packaging program or to host an event, contact Waggoner at rwaggoner@stophungernow.org or 321-445-1252. For more than 15 years, Stop Hunger Now has been creating a movement to end hunger. More than 100,000,000 meals have been packaged and distributed along with other aid to 65 countries impacting millions of lives. The organization is driven by a mission to end hunger in our lifetime by providing food and life-saving aid to the world's most vulnerable and by creating a global commitment to mobilize the necessary resources.